So, you go out and purchase a communications system that will alert tens of thousands of people simultaneously in a crisis situation using ... text messages ... e-mail ... loudspeaker systems ... whatever. Finding a technology that will do the job, even purchasing and installing the software and hardware is the easy part. Some institutions are finding that they may already have a fairly practical solution in place, one that they did not know they owned. On a number of e-mail discussion lists, I have read criticism of companies that provide such systems for their marketing of them in the week following the Virginia Tech shootings. I do not personally feel any negativity about companies who were quick off the mark to promote these kinds of services because I am as aware as anyone that one of the "hard parts" is finding the will, establishing the policy, and getting the budget required to purchase something you might never need. Memories fade quickly in the aftermath of crises such as these. We thought that the multiple damage to higher education institutions that occurred during 9/11 would cause a surge in planning for coping with disasters, where earlier events such as the Northridge Earthquake, floods and various tornadoes and hurricanes, had failed to cause much of a stir on unaffected campuses. However, by 2005 FEMA had essentially killed the Disaster Resistant Universities program, and folks on campus had other things to worry about. Then we thought that the difficulties experienced during Katrina would keep the institutional eye focused on the need for emergency and crisis planning. We now had a second example of what could happen to many institutions at once. Since then, a great many IT staff on campuses have been outspoken about the need for such things, and EDUCAUSE is continuing a business continuity project that is of great value. Sadly, although there has been more attention paid than ever before, being ready for the "unthinkable" is not something that seems to have penetrated many campuses in a systematic way. So, of course people who have related products to sell want to put them before potential customers while there is still attention being paid to the topic. And those who have done it in an inappropriate way will no doubt find out from those potential customers just how inappropriate they thought it was. After 9/11 and Katrina, the National Association of College and University Business Officers (NACUBO) and the American Council on Education (ACE) received funding from TIAA-CREF to create the Campus Relief website. It is intended to be "a resource for institutions, students, faculty, and staff to aid in the recovery from these ... disasters." Unfortunately, and this is not a criticism of the Campus Relief website--I'm really glad that this resource is there because there will come a time when it is needed--the Virginia Tech shootings were not the kind of crisis that it was designed for. Not only was there very limited physical damage, but Virginia Tech proved very capable of providing much of what it needed in the aftermath. Its staff did, and continues to do, an excellent job. Does every higher education institution need an instantaneous communications system to reach out to students, faculty, staff, and possibly neighbors? I don't know the answer, but I doubt it. Should we spend a lot of money cobbling together whatever we can from the current state of the art of related technology, when things are changing so rapidly in communications technology that we don't really know for sure what kinds of devices our constituents will be using in five years? I doubt it. Should we be looking at systemic communications systems that serve a whole lot of other needs and maybe handle the crisis communications thing as part of an entire package? Yes, probably. We do have communications issues: keeping track of students' phone numbers when they are not the ones we issue them, keeping track of students' e-mail addresses when we know that many of them only occasionally check in with the official ones we provide them with; these are day to day issues with registration, tuition, and business continuity implications for the institutions that are for certain going to happen every single day. Now, what about the system you might already have in place on campus? It could be that the already-installed sound warning system you have can be a whole lot more flexible than you thought. On the EDUCAUSE CIO Constituency Group's e-mail list recently, a number of those posting revealed they had discovered just such untapped flexibility in systems on their campus. One southern campus has taken a close look at the very loud PA system in its football stadium, which happens to be right in central campus anyway, and at the sound system in its "memorial tower." (The latter sound system has been "turned down" for years because it has such a loud capacity. On another campus, the IT staff discovered, when they inquired, that the current fire alarm system creates "bell" sounds using capabilities that also let it broadcast voice messages. 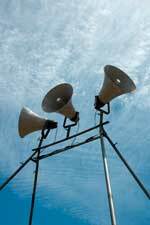 A Midwestern school discovered, when they looked, that the tornado alarm system they have in place can broadcast voice instead of sirens. That CIO was looking forward to how people would react to invisible loud voices from the sky when they ran their first tests. Obviously, other campuses, especially state schools and especially community colleges, are embedded in wider communications alarm systems where they'll simply benefit from what the larger state or local organization is doing.